A ball is a formal dance party. 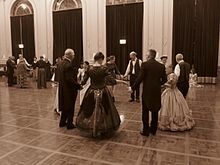 Social dance forms a large part of the evening; actual ballroom dancing may or may not occur. The word "ball" derives from the Latin word ballare, meaning "to dance"; the Latin word also developed into French baller—from where it swapped into languages like English or German—, and bailar, the Spanish and Portuguese verbs for "to dance" (although all three Romance languages also know danser, danzar and dançar respectively). Catalan uses the same word, ball, for the dance event. A well-documented ball occurred at Kingston Lacy, Dorset, England, on 19 December 1791. The occasion was to celebrate the completion of major alterations to the house and the event was organised by Frances Bankes, wife of Henry Bankes, owner of the house. The event involved 140 guests, with dancing from 9pm to 7am, interrupted by dinner at 1am. ^ "Frances Bankes' ball at Kingston Lacy 19 December 1791 (From Regency History)". Regency History.net. Retrieved 2014-01-03. Wallace, Carol McD. ; et al. (1986). Dance: a very social history. New York: The Metropolitan Museum of Art. ISBN 9780870994869.